Iterchimica will attend the Argus West Africa Roads Conference that will take place in Accra, Ghana, from the 4th to the 5th of December 2018. Come and meet us at our booth! Iterchimica will attend the SITP (International Trade Fair for Public Works and Construction Machinery) that will take place in Algiers, Algeria, from the 21st to the 25th of November 2018. Visit us at booth no. B4! Iterchimica will attend the “4to Congreso Nacional de Pavimentos Asfálticos” that will take place in Lima, Perù, from the 20th to the 21st of November 2018. During the event, Eng. Blanca Durand will make a presentation on additives for warm mix asphalt. Vist us at our stand! Iterchimica S.r.l. will attend the ASPHALTICA WORLD event, organized in Rome, at the Salone delle Fontane, from October 25th to 26th 2018. Two days of training and updating dedicated to the road infrastructure sector, during which there will be 4 conference sessions organized by SITEB. Come and meet us at booth R13! 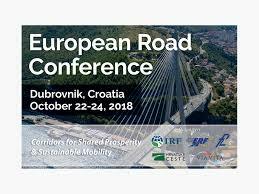 Iterchimica will attend the European Road Conference 2018 that will take place in Dubrovnik, Croatia, from the 22nd to the 24th of October. On Tuesday 23rd from 04:00 to 05:30 p.m., Eng. Lorenzo Sangalli will present his paper entitled “Rap rejuvenation with specific chemical additives”. Iterchimica will attend the conference “Argus Pavement Technology Asia 2018” that will take place in Singapore from the 17th to the 19th of October. The presentation “Modern asphalt mixes and testing methods – related properties and performances” will be held on October 19th at 10:10 a.m. Come and meet us at our booth! Iterchimica will attend the 15th National Romanian Congress of Roads and Bridges that will take place in Iasi, Romania, from the 19th to the 22nd of September. Come and meet us at booth no. 10. Iterchimica will attend the 4th MESAT Conference 2018 that will take place in Beirut, Lebanon, from the 4th to the 6th of July. The presentation “Improved Performance Grade by using an innovative PMA solution” will be held on July 4th at 03:00 p.m. Come and meet us at booth n°6.